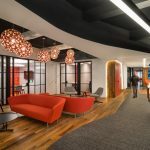 The General Services Administration (GSA) desired a building for its Houston, Texas, office that would not only enhance its identity in the community, but would also provide a comfortable, flexible, efficient, and aesthetically appealing work environment. The design team* approached the 275,000 square feet of space with security, sustainability, and appropriate imagery in mind. And the end result? A LEED-certified, award-winning space — including Glass Magazine’s “Most Innovative Energy-Efficient Glass Project” Crystal Achievement Award in 2010. The long, narrow building was sited to maximize the amount of daylight for all employees and the work environment as aÃƒâ€š whole. Enclosed spaces create boundaries for the open spaces, but were also situated to maximize daylight to all workspaces. The floor plate also enables future flexibility. The plan is purposefully narrow, presenting broad faces to the south and north, and thin faces to the east and west. Daylighting and views are provided to nearly all work areas through careful design of the building floor plate, window size, high floor-to-ceiling height and careful interior space planning. The exterior materials give the building a dominant, yet integral, presence in the neighborhood.Ãƒâ€š A lightweight metal frame hangs off of the concrete walls to carry a “second skin” for the building to provide shade on all but the north sides. The concrete walls are sheathed in aluminum shingles that both reflect heat and allow the high thermal mass of the concrete to benefit the temperature stability of the structure. Laminated patterned frit glass with a PVB inner layer is attached to the frame with stainless steel clips, which create small dots of light reflectance on the faÃƒÆ’ §ade. The outer layer comprises an almost opaque green glass, which is placed away from the actual thermal wall of the building, shades the structure substantially from direct heat gain from the hot Texas sun. The space between the two skins becomes a significantly cooled microclimate reducing the load requirements for air conditioning systems. The large space between the primary face and the exoskeleton also constitutes a shading device for punched vision windows. The high-performance skin of the building is employed as a major image generator.Ãƒâ€š Because of the depth and richness of the building’s surface, its massing could be kept very simple and economical. The aluminum shingles provide a bright, neutral backdrop on which to project the constantly changing light and shadow patterns from the glass skin. The floating glazed facade aesthetically conveys a sense of weightlessness that a conventional solid wall cannot. Colored a deep, rich green, the glass mutes the bright sun and lends it a subtle hue. In the lush green context of suburban Houston, the color of the building feels natural and integral. In fact, the GSA building was identified by the American Bird Conservancy as a “bird-friendly” designed building because of this use of the green glass. It was challenging to get the glass just right, however. The designers were looking for certain qualities in terms of color, price, translucency/transparency, solar shading, and reflectivity. They started with translucent green glass but eventually gravitated to frit, then explored a number colors, densities of frit, and patterns. Developing a composite monolithic panel with a laminated interlayer which coordinated with the building exterior modular bay spacing and met aesthetic concerns also was a challenge. Apertures in the glass skin, sized somewhat smaller than the actual windows, are carefully placed to provide excellent daylighting with reduced glare for interior work spaces. For building occupants, vision glazing admits copious quantities of light through the oversized, nine-foot-high windows and a broader sense of the outdoor landscape. Meticulous attention was paid to the quality of the interior light, particularly as the intense south Texas sun can create extreme glare conditions, and every effort was made to modulate the light conditions. As light filters through the green glass it creates a beautiful natural light “fixture.”Ãƒâ€š This is supported by very consistent rhythm of suspended linear fixtures over all open work spaces. The open areas are punctuated with a linear wall sconce with a green glass slot that matched the exterior glass. The play of light created by the green fritted glass and the aluminum cladding gives the impression that the building is glowing from the inside. By integrating concerns for function, technical performance, and mission-specific requirements into well-synthesized holistic design solutions, the GSA office building creates a simple, elegant, and economical building well-suited to its specific purpose, the well-being of its employees, and the goals of its organization. *Leo A Daly / LAN+PageSoutherlandPage, a joint venture, Houston, was the architect/engineer for the project. PageSoutherlandPage, provided architecture, interiors, MEP engineering, commissioning and LEED consulting. Yates Construction was the general contractor. The Sharing Economy: What’s in it for Me?